Heat shock protein 70 (Hsp70) is a molecular chaperone that plays critical roles in protein homeostasis. Hsp70’s chaperone activity is coordinated by intra-molecular interactions between its two domains, as well as inter-molecular interactions between Hsp70 and its co-chaperones. Each of these contacts represents a potential opportunity for the development of chemical inhibitors. To illustrate this concept, we review three classes of recently identified molecules that bind distinct pockets on Hsp70. Although all three compounds share the ability to interrupt core biochemical functions of Hsp70, they stabilize different conformers. Accordingly, each compound appears to interrupt a specific subset of inter- and intra-molecular interactions. 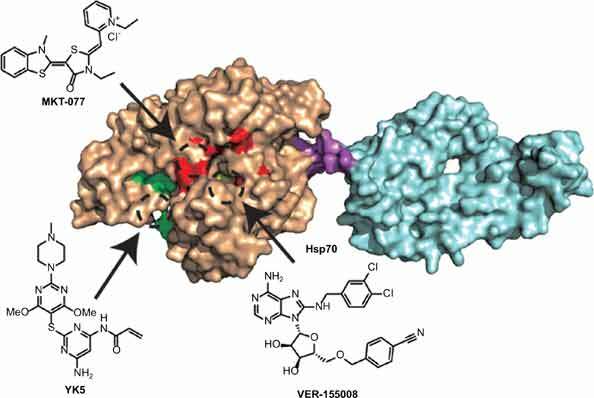 Thus, an accurate definition of an Hsp70 inhibitor may require a particularly detailed understanding of the molecule’s binding site and its effects on protein-protein interactions. Chaperone, Protein folding, Proteostasis, Irreversible inhibitors, Dynamics, Protein-protein interactions. University of California at San Francisco, Department of Pharmaceutical Chemistry, 675 Nelson Rising Lane, Room 311, San Francisco, CA 94038, USA.